Rose water has many benefits. Rose water was first taken by the Persians around the 10th century. Currently, the majority of rose water and rose essential oil still comes from this area. Although it takes a lot of rose petals to make rose water, but a lot of benefits can be obtained from the rosewater. These include antibacterial, soothing, healing and antiseptic properties. The water is very rich in flavonoids and vitamins, including A, C, D, E and B3. Can reduce the risk of bladder infections and heart disease, ease digestive problems and nervous tension, reduce eye irritation and toothache caused by paradontosis, and so on. Rose water is widely used for skin care because it is safe and gentle enough for all skin types. Rose water works well on dry skin and aging, as well as the skin oily and prone to acne. Rose water has a nutritious as astringent tonic which helps reduce redness caused by enlarged capillaries. Rose water is great when added to a bath of hot water for bathing and relaxation. Rose water has a calming effect and has been used to treat stress, nervous tension, stress-induced psychosomatic such as peptic ulcers, and heart disease. Rose petals are used to make rose water contains a lot of vitamins, including vitamin A, B3, C, D, and E. In addition, falvonoid (antioxidant), tannins, and zinc are also often found in rose water. All content is working to improve the texture and overall skin health. Rose water is also used as an herbal tea for therapy, or abdominal stress treatment, and bladder infections. Herbal teas rose water also serves as a warm drink that has a calming effect. Many exotic foods added with a small amount of rose water to get a sense of the unique and interesting. Some examples of foods, given plain water rose are Greek pie, Indian curries, ice cream, pudding, baklava, and marzipan. Rose water is very beneficial for hairthat is why often used as an ingredient for hair care products and shampoos. Rose water increases blood flow to the scalp to nourish and strengthen hair follicles and prevent hair loss. 1. Rose water can help resolve inflammation and irritation of the skin. If the skin is too dry and vulnerable, then you can compress with rose water. 2. Rose water is used both as a cleanser. Moreover, it can moisturize the skin and prevent and treat acne. 3. Anti aging. Rose water helps fight the signs of aging and protect skin from wrinkles and inflammation. 4. Smooth the skin. Natural cleaning ingredients of rose water into a powerful composition to fight acne. 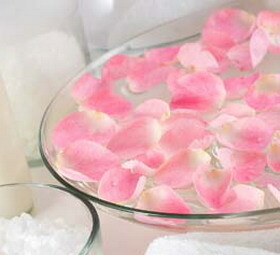 The content of rose water can also tighten and reduce the size of the pores, making the skin look younger and smoother. 5. The smell of roses can improve mood. Provide peace and relieve stress. When the body is tired and strained mind, add rose water in the tub and soak in it for 15 minutes will give different relaxation. 6. Prevent skin diseases. Rose water helps maintain the skin's natural pH balance so they can against various skin diseases and eczema. 7. Balance the skin oil. Sebum production can be balanced by using rose water. This applies to people with oily skin or dry skin. 8. Cleaning the skin. The antibacterial properties of rose water can clean the skin thoroughly yet gently. Soft rose water to prevent damage to the skin when cleansing your face every day.